If you’ve picked up a dog or two in Cambodia (it’s hard to resist), be sure to plan in advance when it’s time to go home. The entire process of exporting a pet from Cambodia usually takes four to six months, so be prepared. The following instructions are for the US, EU, and UK, which have fairly similar procedures. Although I mention specific vets in this post, you are free to use any qualified vet in Cambodia. Don’t worry, it’s possible to take your furry friend home from Cambodia with you. For the US, EU, and UK, your pet will need a 15-digit microchip that is registered online. The microchip must be implanted before their last rabies vaccination and their rabies titre test. The cost is $80 at VSL in Phnom Penh or $25 at Ouk Hok Sy Veterinary or Angkor Vet Clinic in Siem Reap, and can be done as far in advance as you would like. VSL additionally offers a $25 pet travel consultation service where they will help make sure you are following all of the steps correctly. 30 days after their rabies shot, you can proceed to the rabies antibody titre test. The rabies antibody titration test is a blood test that confirms that your pet has the correct amount of antibodies in response to the rabies vaccine in its bloodstream. The test cannot be given for 30 days after the last rabies vaccination. The test must be done from a EU-approved laboratory, and once your pet has received a passing grade, you must wait 3 calendar months to export. VSL Veterinary Clinic in Phnom Penh charge $200 for this service and the results take approximately 6 weeks to come back. If you are in Siem Reap or have multiple dogs you can send the blood samples directly to an approved lab yourself to save some money. This is also a good option if you need your results more quickly. Many expats have had great experiences with BioBest lab in the UK. To do it yourself, you will need to go to a qualified veterinarian to get a blood sample and ask them to convert it into serum. The cost is $25 per animal at VSL in Phnom Penh and $20 with Ouk Hok Sy Veterinary in Siem Reap. Then, following the very detailed instructions from the BioBest site, ship the samples to them using an reliable shipper such as DHL. The cost for shipping from Cambodia is around $85 using DHL, and less than $40 if you use EMS. BioBest charges £60/$80 to test each sample. They will email you your results within 2-7 business days, and include a scan of the certificate. You can choose to have the results shipped to you by regular airmail for free, with airmail with tracking for £10 ($14), or couriered for £80 ($110). Adding the tracking option infinitely increases the odds that your mail will be delivered in a reasonable amount of time (and be sure to include your phone number as part of your return address so the post office will call you to pick it up). If your pet gets a passing grade, after 3 calendar months you are free to leave Cambodia after completing the following steps. Getting ready to leave Cambodia with a pet. All animals leaving Cambodia must be issued an export permit from the Ministry of Agriculture in Phnom Penh. The export permit can be issued in advance (exactly how long is not defined, but some have gotten theirs more than 30 days in advance) but the exact date of travel must be supplied at the time of application. Your pet does not need to be present. The cost is $20 if you get the permit directly at the Department of Animal Health and Husbandry [map]. As usual, the official fee is unknown—in all likelihood it’s probably supposed to be free! You can usually get the permit the same day if you arrive in the morning. Bring a document detailing your flight information, pet’s name, vaccination records for both rabies and up-to-date annual vaccinations, and a copy of your passport. You can also request an export permit from your vet. The cost at VSL in Phnom Penh is $60 and at it’s included with the health certificate mentioned in the next step at Angkor Vet Clinic in Siem Reap for $40. Going through a vet is much easier, but takes a little bit longer—usually 7 to 10 working days, but beware of Cambodian holidays as this can cause it to take even longer. Your dog will need more paperwork to leave Cambodia than you will. If you’re headed to the EU or UK, you’ll need to get a third-country veterinary health certificate and Declaration for the Non-Commercial Movement of Animals issued within 10 days of you entry into Europe. Also known as the ‘Annex IV,’ these are complicated, multi-page documents that can be found on the official EU and UK pet-moving sites. You can find a sample form online. The cost for these third-country vet health forms varies. VSL in Phnom Penh charges $60 and Angkor Pet Clinic in Siem Reap charges $40 for this and the Cambodia export permit. Be sure to check the document carefully when you receive it, because many Cambodia vets are not experienced with this paperwork and several expats have caught mistakes on theirs. It is also important to note that at the time of writing, VSL in Phnom Penh is the only clinic that submits their Annex IV forms to the Ministry of Agriculture for endorsement (which means their forms take 10 days to business days to complete). It’s not entirely clear if this is necessary as many have entered Europe without it, but VSL is easily the most knowledgeable in Cambodia when it comes to pet importing and exporting, so their interpretation is probably the correct one, even if it is not being currently enforced. Other clinics offer same-day turnaround but no official endorsement. Dogs who are going to the US just need a simple health certificate from their veterinarian, and a screwworm certificate that must be issued less than 5 days before they travel. Cats headed to the US do not need either, unless the airline requires it (and many do). Dogs flying to Finland, Norway, Malta, Ireland or the UK will need a tapeworm treatment at least 24 hours before they leave. The treatment must be administered by a licensed veterinarian. Once the treatment is administered, it is good for 120 hours (5 days), so make sure you schedule your trip to arrive in your destination country in that time frame. The cost is $4 to $20 (depending on the weight of the dog) and can be administered at the same time the veterinary health certificate is being completed, or immediately before you leave. Be sure to check with your airline in advance to make sure they do not have any additional regulations regarding carriers, as most will have specific requirements. Some airlines also have restrictions on certain breeds of dog or weight limits. They will require the crate to be large enough for your pet to stand up without touching the ceiling and to be able to turn around comfortably. Others may require additional transit certificates for the transit city. Different airlines have different pricing scales for traveling with pets in cabin or as baggage. The cost is usually around $100 for pets that travel in the cabin and $200 to $250 for those who travel as baggage, although some airlines charge by weight. Some may charge extra if you have a layover more than a few hours to cover the extra service of feeding or checking on your pet. For instance, KLM charges $200 for this service, but will take your pet for a walk. Be sure to let the airline know in advance that you will be traveling with a pet as some have a limit on the total number of pets that can be on a flight. Some airlines that fly from Cambodia and allow pets are: Vietnam Airlines, Qatar, Cathay Pacific, EVA, Bangkok Airways, Thai, Asiana, Korean Air, Malaysia Airlines. Lufthansa and KLM also travel from Bangkok, but codeshare with Bangkok Airways to leave from Phnom Penh to Siem Reap. 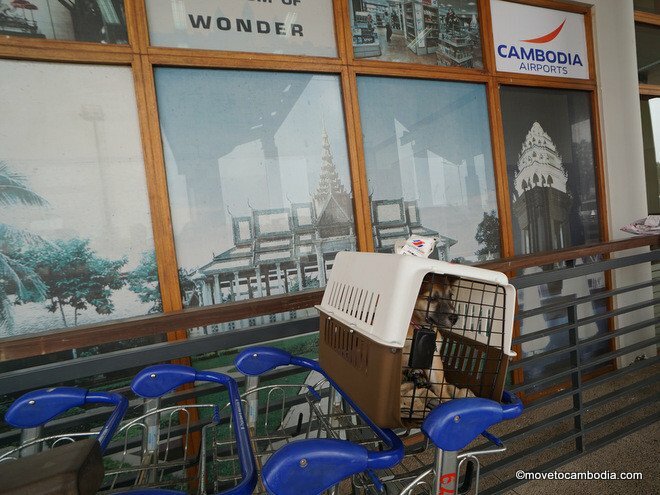 Note that Cambodia Angkor Air do not allow pets, and this includes flights that are code-shared with Vietnam Airlines. If you’re traveling through Thailand with a pet, there are additional requirements. 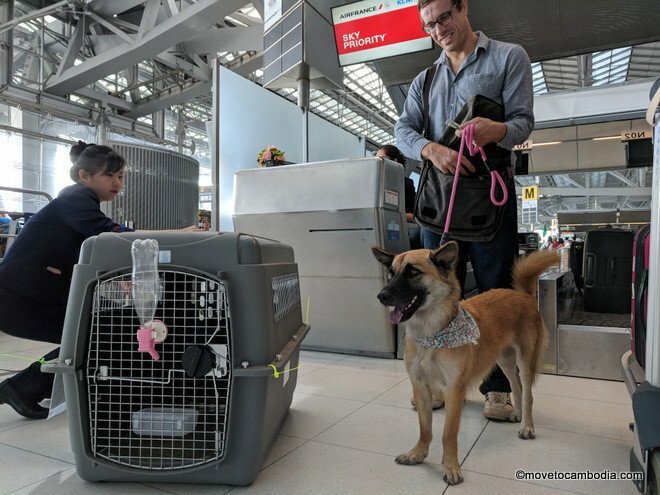 The procedure is designed for those transiting by plane, so if you are flying into Suvarnabhumi (BKK) Airport, head directly to the quarantine office and get your paperwork and have your pet’s microchip scanned, which you will need to board your next flight. If you are traveling overland to Bangkok, the procedure is a bit unclear. Although technically you should get a transit permit, the quarantine office at the land borders add an extra complication to your journey and are not strictly necessary. If you’d like to do it by the book, head to the quarantine office at the border (for the Poipet/Aranyaprathat border the quarantine office is approximately 8km away) and be prepared to spend a fair amount of time there, as very little English is spoken and the staff are not familiar with the transit permit paperwork. 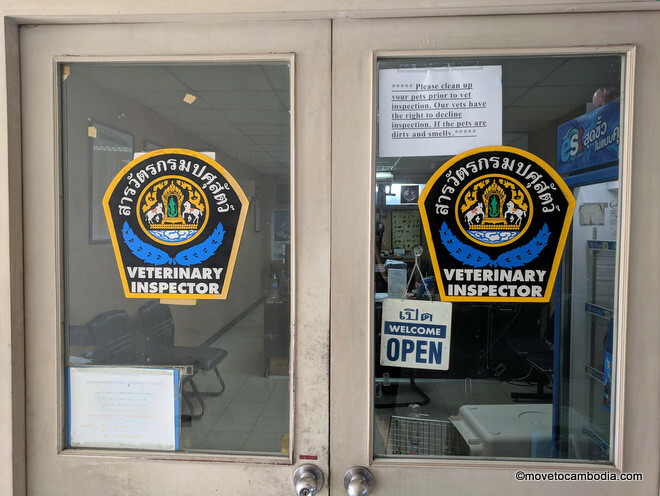 Once you complete the process, you’ll still need to visit the office at Suvarnabhumi to get your pet’s microchip scanned. The other option (because no one seems to ask to see any paperwork at the Cambodia border anyway) is to skip the quarantine office at the border and head straight to Suvarnabhumi and get an export permit instead. If you get an export permit rather than a transit permit in advance, your pet will need a health check at the airport. The cost for a transit permit is 260 Thai baht ($8) per animal. They say you need to go 2 to 3 days in advance to get the transit permit, but as the health check and paperwork processing usually takes less than 4 hours, many expats only stop in Thailand for a day. Be warned, though, that the office is only open Monday through Friday until 4 or 4:30 p.m. and is closed on all of the many Thai holidays, so make sure to give yourself enough time before your flight. Also get there a little bit before they open at 8:30 a.m., because a line quickly forms and often includes pet store exporters with a dozen dogs, which can make for a long day of waiting. The staff at Suvarnabhumi quarantine office are very well-versed with the forms you will need, so make sure your Annex IV and vaccinations are in order, otherwise you will not be able to leave Thailand. 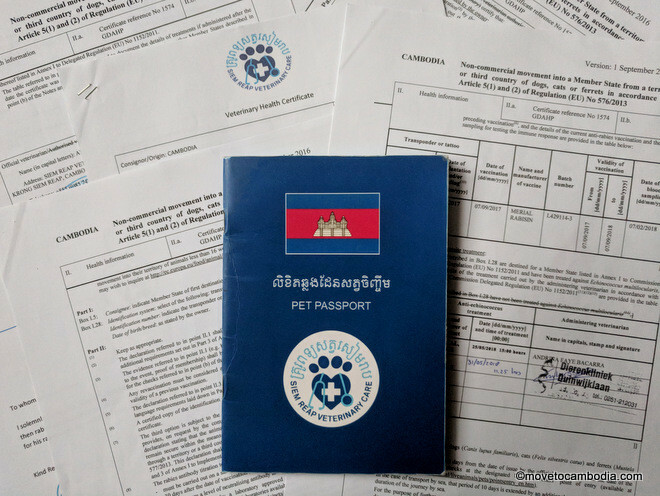 If you need any additional paperwork from a local vet, some expats have used Relo4Paws, a UK organization based in Bangkok that sends soi dogs abroad for adoption. There are many pet-friendly hotels in Bangkok, including Ploykhumthong Boutique Resort and Villa Volpi Bed and Breakfast, which are both fairly close to the airport. There is also a cat-sitting service where you can leave your cat overnight. You cannot import a pit bull or American Staffordshire terrier into Thailand, so these dogs cannot go overland or exit the airport, nor will Thailand issue an export permit for pets less than four months of age. There are several official Thailand government sites about importing and exporting pets that you can check for additional information. 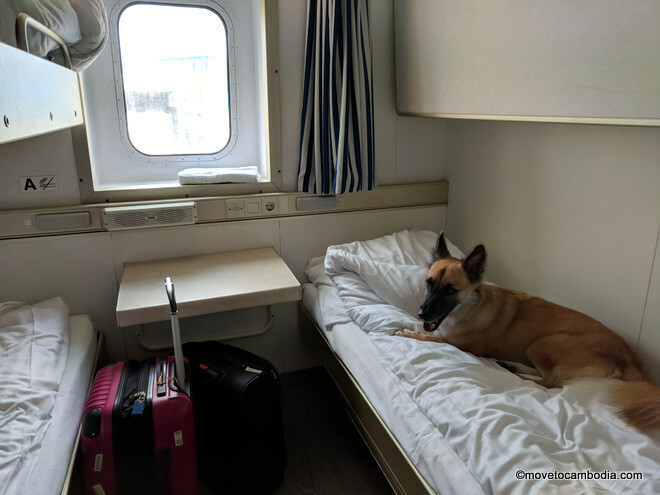 A pet-friendly cabin on the Amsterdam to Newcastle ferry. The requirements for importing a pet into the UK or Ireland is mostly the same as the rest of the EU listed above, although there is one major complication. Pets cannot come into the UK either in the cabin of the plane or as excess baggage. Instead, they must be shipped as cargo, which requires hiring an agent on either end to manage the process (you cannot do this yourself). This makes the process much more expensive, and costs approximately $2500 to $3000 per animal. In Cambodia, Pet Services Cambodia and Animal Mama offer this service, but they only organize the shipment and do not move the pets themselves. To work with the shipper directly, AWG Trucking Service has a pet moving specialist, Ms. Him Socheata ([email protected], 077 722 788, 016 581 757) who is very responsive by email and speaks excellent English. There are additional companies in Thailand and Malaysia that can be found online. Note that while you do not need to be on the same flight as your pet if they are shipped as cargo, you must fly within 5 days of them. Many expats who are going to the UK or Ireland circumvent this requirement by flying to somewhere in the EU, and then traveling onward to the UK by road or ferry. The most popular routes are flying to Paris and then driving through the Channel Tunnel (pets are not allowed on the Eurostar train) to Folkestone in the South of England, or flying to Amsterdam and going to the UK by ferry. There are several ferry routes from Holland, including Amsterdam to Newcastle, Rotterdam to Hull, and the Hook of Holland to Harwich, some of which will allow you to bring your pet in the cabin with you, while others have a special kennel on board. If you are traveling by sea or rail, you must use one of the routes approved by the UK government, or you will not be allowed entry. You will also need to have your pet given a tapeworm pill by a vet (and get a document certifying this) no less than 24 hours and no more than 120 hours (five days) before you enter the UK. If you take more than 5 days to enter the UK from the time you leave Cambodia, your dog will need to get an additional tapeworm treatment (Dierenkliniek Duinwijklaan in Amsterdam was happy to do this). You also must enter the EU within 10 days of your official veterinary certificate being issued. When you arrive in the EU you will need to get it signed and stamped, and it is then valid for 4 months for additional travel with the EU (including to the UK). After that you will need to get a EU pet passport. For more information about bringing a pet to the UK, see their official government site. Note that regulations for bringing animals into the UK via Europe may change because of Brexit, but it is still unclear if and when that will happen. One added requirement for Ireland is your pet will need a compliance check on arrival. You can organize the compliance check in advance with Lissenhall Veterinary Hospital ([email protected]) or Vets Direct ([email protected]). For more information about bringing a pet to Ireland, check their official government site. You must bring a record of your pet’s vaccinations, and more specifically their rabies vaccinations to comply with US Department of Agriculture guidelines. But be aware that some states have additional guidelines, so be sure to check in advance. Hawaii has particularly stringent requirements. To find out more, visit the Department of Agriculture’s page about importing and exporting pets to the US and the CDC page on the same topic. Australia’s regulations are considerably more stringent and complicated and are not covered in this guide. Pets cannot be imported to Australia directly from Cambodia and need to stay in a third country such as Malaysia to complete the necessary blood tests before they fly. The process can take between two and six months. For a good overview of the process there’s a very detailed blog by someone who has done it. The Expets Cambodia group on Facebook is dedicated solely to importing and exporting pets from Cambodia. If you have questions, check their first, and get up-to-date travel stories from those who have already done it to help calm your nerves. Open Monday to Friday, 8 a.m. to 6 p.m., weekends 8 a.m. to 5 p.m.
* This post was written based on my own and the experiences of many other expats, and in consultation with Cambodia veterinarians. That said, things change in Cambodia regularly, so it’s a good idea to do a sanity check on even the most thorough of blog posts. This entry was posted in Expat Life, Practicalities and tagged pets in Cambodia, dogs in Cambodia, Poipet border, importing and exporting pets. Bookmark the permalink. I’m doing research into flying my cat to the UK (via France) from Phnom Penh. Everything I’ve read online about Bangkok Airways implies that they only allow animals in the cargo section. How does this work if my Air France flight which would be the second leg allows the cat to be with me in the main cabin? Not sure if you can answer this but would really appreciate advice! Lina, THANK YOU for writing this much-needed post!! I would like to take my cat from Cambodia to Australia and everyone who shares their international pet-relocating experience makes it easier for others to do the same. ???? ?